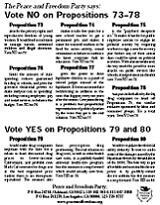 To print this flyer on the statewide propositions, download the PDF version, which prints on a single 8.5 by 11 inch sheet of paper. 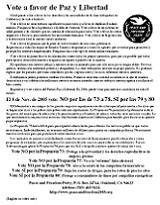 This flyer was created to include some content about the party's politics, that was already available in translation to non-English languages, together with some content about the November 2005 elections. 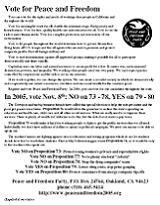 Just download the Oakland PDF version, the Northern California PDF version, or the Southern California PDF version and print the two pages back to back on 8.5 by 11 inch paper. The Oakland version includes mention of our local Assembly candidate and was distributed at the Fruitvale Día de los Muertos celebration on October 30th (with a few more typos and a more awkward layout). The Northern California and Southern California versions are identical to each other except for the contact information. They also include some improvements to the text and layout of the Spanish side that were made possible by having one less line of text to include. 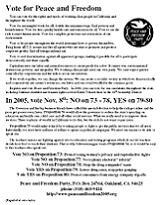 There are also old leaflets not primarily addressing any specific local or statewide candidate or issue.